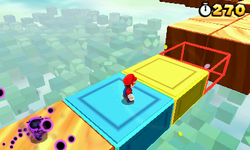 Special 7-2 is the second level of Special 7 in Super Mario 3D Land. It is based off of World 6-4. The player starts off on a wooden platform with some Beat Blocks next to it, these lead to a larger platform with some ? Blocks and a Door that leads inside. Inside are some more Beat Blocks, a door that leads back outside and a Red Ring that will spawn five Red Coins, if all of the coins are collected in time the player will receive either a 1-Up Mushroom or a Statue Leaf. Outside are some more platforms with Beat Blocks, near the end of the level some of the Beat Blocks have chained spiked cylinders on them. At the end of this section is the Goal Pole. Star Medal 1: Floating above a Rectangular ? Block in the first area of the level. Star Medal 2: Floating next to a wall near the end of the level. Star Medal 3: Floating above a yellow Beat Block and a chained spiked cylinder.